We’d love your help. 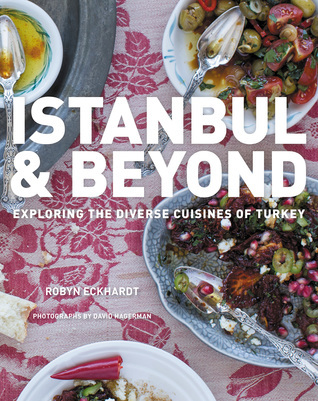 Let us know what’s wrong with this preview of Istanbul and Beyond by Robyn Eckhardt. To ask other readers questions about Istanbul and Beyond, please sign up. 9/10 Tested recipes for this book and already pre-ordered! Can't wait for the October release! 10/21 The cookbook finally arrived! Prior to publication, I tested recipes for kete (p.93), kule (p.92) and eggplant pickles (p.156). Below is an ongoing list of recipes we've tried since the book was published. Mercimek corbasi (p.43) - This recipe is very similar to the recipe I typically use. The only differences are that this one calls for 1/2 cup more lentils, butter instead of oil, and no salca. T 9/10 Tested recipes for this book and already pre-ordered! Can't wait for the October release! Mercimek corbasi (p.43) - This recipe is very similar to the recipe I typically use. The only differences are that this one calls for 1/2 cup more lentils, butter instead of oil, and no salca. The color is lighter without the salca, but the taste was excellent with a richer flavor due to the butter. I added more mint and pulbiber and served without the additional butter on top. The photography in this cookbook is so breathtaking I would frame pages and hang them in my home. The recipes are also beautiful: many uses for grains and fish that were new to me, lots of bright tomato dishes and lovely breads. I am excited to try a few recipes soon. I celebrate the cookbook ‘Istanbul & Beyond : Exploring the Diverse Cuisines of Turkey’ by the deeply-admired food writer Robyn Eckhardt. More than five years in the making, this cookbook not only makes me want to cook, but to also get in a car and get out there to explore Turkey, just as Robyn and her husband Dave Hagerman did in discovering and documenting recipes. What a collaboration! Dave is an award-winning photographer and took all of the photos showcasing Anatolia and her food-ways th I celebrate the cookbook ‘Istanbul & Beyond : Exploring the Diverse Cuisines of Turkey’ by the deeply-admired food writer Robyn Eckhardt. More than five years in the making, this cookbook not only makes me want to cook, but to also get in a car and get out there to explore Turkey, just as Robyn and her husband Dave Hagerman did in discovering and documenting recipes. What a collaboration! Dave is an award-winning photographer and took all of the photos showcasing Anatolia and her food-ways that Robyn researched, tweaked and tested. You can follow Robyn on Twitter at @EatingAsia. You can follow Dave on Twitter at @DaveHagerman. On Twitter, they both share work they do on a regular basis for the New York Times, the Wall Street Journal, and magazines like Saveur. The cuisines of Turkey are among the finest in the world. Robyn has not only presented recipes that don’t intimidate, she has also focused on easily-accessible ingredients, and lovingly explained the regional culinary specializations of each area of Turkey. Not being well-traveled, I appreciate the photos and back stories that accompany many of the recipes. I am looking forward to trying out many of them. Although I'm not sure I can find all of the ingredients, I am sure that I can figure out a suitable substitution. Looking forward to cooking from this book. This is definitely a cookbook that will soon be marked with stains of grease and traces of flour. I have added several recipes to my new favorite dishes for everyday meals or treats to share at parties. The recipes are easy to follow and many of the ingredients are easy to get in almost any grocery store. The photographs are beautiful and breathtaking. I love it! I have followed this blog forever and love all of the posts. I'm happy they finally finished their cookbook. It's excellent and so beautifully illustrated. I only hope they do one on Asia next. Perhaps the cuisines of Malaysia. Turkey has long been on my list for places to go, so this books about its regional cuisines was the perfect armchair visit. The photography is beautiful and the commentary is so interesting. I acquired a few recipes too, naturally!